Clients make a choice every time they book and appointment for services at your salon. These days, clients really think twice about where they spend their hard earned money, and what they get out of their choices. Little touches make BIG impressions, and some things can cost you little or nothing for the client to enjoy! That's why we LOVE these new Salon Cell Phone Saver Sleeves. For less than .03 cents each, these clever little sleeves protect phones from coming into contact chemicals and color during salon appointments. A great way to ensure clients will not damage expensive phones with bleach, chemicals, straightening product or accidental spills. Offer your clients a thoughtful and professional solution! A great way to show your clients you care, make a great impression for just pennies! Each sleeve fits almost ALL smart phones and cell phones. 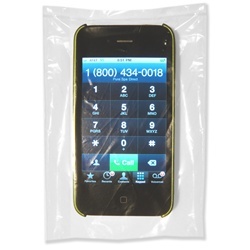 Just slip it on this disposable cover and your clients can resume their texting and conversations without worry. Salon services can carrying on without worring about wiping,wetting or staining your clients expensive devices! Hmmmm. let's see... 3 pennies for a baggie or replacing a $600 phone -- it's really a no brain-er.